Guatemala is home to over 720 bird species. These birds are found in various ranges across the country including highlands, lowlands, and the Atlantic slopes. About 10% of these species are endemic to the North Central American highland while some species are strictly found in the western regions of the country. The Atlantic slope region contains the highest number of species, about 500 of them, most of which are native. These are some of the famous native birds of Guatemala. The Olive-backed Euphonia (Euphonia gouldi) is a bird found on the Caribbean slope of Middle America, ranging from southeast Mexico to western Panama. Both male and female are distinctively plumaged in a deep green color and rufous on the posterior underparts. 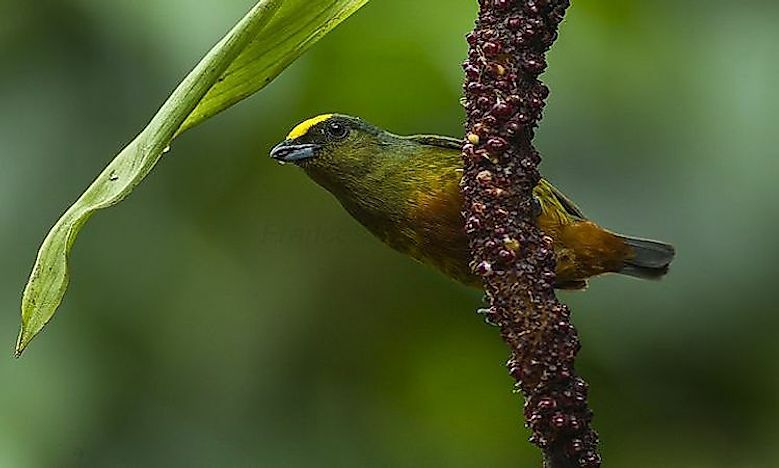 The male bird has a small yellow forecrown while the female has a rufous forecrown.The Olive-backed Euphonia is mostly found in small groups and more often in pairs. This bird likes to stay in the middle to upper levels in forests and also in the tall and second growth and shady clearings. The Olive-backed Euphonia is not a globally threatened bird, but much of the population has been reduced with the loss of rainforests. The Bananaquit (Coereba flaveola) is a common bird found throughout the West Indies and the Caribbean mainland from southern Mexico to Southern Brazil. The Bananaquit feeds on fruits, insects, and nectar found in flowers and trees. It is a sociable bird that can be found around gardens. They are highly productive and can take over a certain region including islands hence making them superb island colonists. These birds can inhabit various habitats such as scrublands to tropical lowland forest edges. As for the conservation status, they are not threatened by human activity and can easily adapt. Since they are found in most parts of the Caribbean, they may have different common names such as Sugarbird, yellow bird (Jamaica, Banana Bird (Bahamas, Nevis, Cayman Islands and many other names. Cedar waxwing can be found in open lowland woodlands with shrubs and small trees. It is a beautiful bird with a blend of brown, gray and lemon-yellow color accented with subdued crest, black mask, and red wax droplets. Cedar waxwings are highly social birds that are seen in flocks all year round. They feed on fruits, especially berries and course over water for insects. They like staying in the woodlands of all kinds, orchards, and gardens. The cedar waxwings are related to the Bohemian waxwing (Bombycilla garrulus). The Ocellated turkey (Meleagris ocellata) look similar to the North American wild turkey but have more bright colors and weigh much less. Both male and female birds have an iridescent bronze-green color but the males are brighter than the female. These birds are endemic to Yucatan peninsula in Mexico, Belize, and Guatemala. They live in tropical deciduous evergreen forests and lowland forests, and occasionally in clearings and farm plots. They live in social groups and mainly feed on insects, seeds, berries, and leaves. Currently, the main threat to the ocellated turkey is posed by the high rate of timber operations which clear the forests and also the burn and slash agriculture which is common in Central America. Other birds native to Guatemala are the Ruddy crake, White-faced ibis, the Crested eagle, Christmas shearwater, Cinnamon teal and Slaty-breasted tinamou.